Last summer I made some Summer Squash and Vidalia Onion Bread Puddings. They made a big splash at our house, so I thought I’d change the recipe up and make it a little more holidayish. Okay, I know that’s a made-up word, but you get my point. I’ve made many variations of stuffing over the years from my Mom’s traditional cornbread dressing to oyster dressing to any number of stuffings with fruit and sausage. I’m always about trying new things and not getting stuck in a rut, so I’m thinking these individual bread puddings might just have to replace stuffing for our Thanksgiving this year. I mean, after all, how much more holidayish can you get than a bread pudding with apples, bacon, leeks, and cheddar cheese? Throw in a little thyme and sage and this recipe has Thanksgiving written all over it. This is the first year I don’t already have my menu completely nailed down, and I’m okay with that. I’m cooking for a small crowd this year, and because my family is happy just to have someone cook for them, I’m sure whatever I make will be a hit. I think what I’m saying is that I’m winging it this year. Whatever shape my menu takes on Thursday, I think it will include these delicious individual bread puddings in place of the traditional stuffing. 2. Brown bacon in a medium skillet over medium high heat. Remove bacon and drain on paper towel. Remove all but two tablespoons of bacon grease. Add leeks and garlic and saute for 4 to 5 minutes, stirring regularly, until slightly browned. Remove from heat. 3. In a small bowl, whisk egg, half and half, salt, and pepper until well combined. In a large bowl, combine apple, cheese, thyme, sage, leeks, bacon, and bread and stir to combine. Add cream and egg mixture and toss until bread is coated with mixture. Let stand for 30 minutes, stirring occasionally. 4. Spray a muffin tin with cooking spray. Fill each cup with bread mixture. Bake for 25 to 30 minutes or until an inserted toothpick comes out clean and the tops are browning. 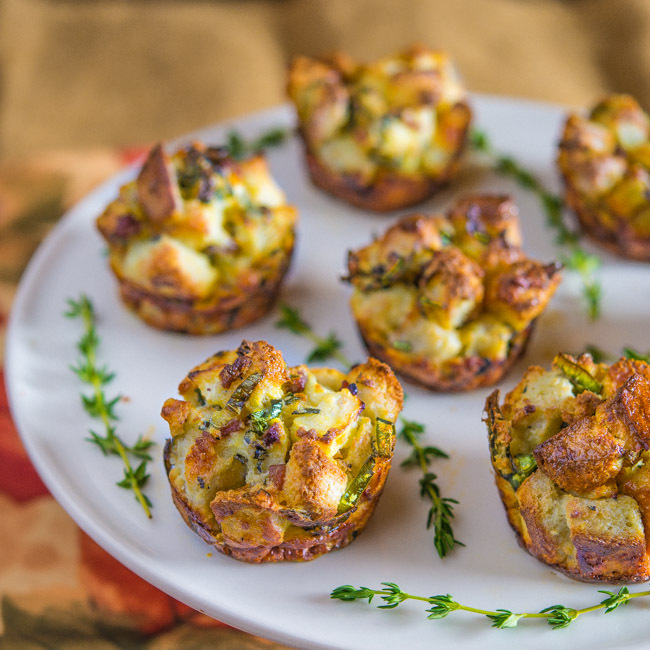 Remove from muffin tin and serve immediately. GAAAAAAAAAAH! Are you kidding me? These looks so freakin’ good, Bill! All of my fave flavors together in one place. Adding this to my to-make list ASAP. Hope you and yours had a wonderful Thanksgiving Day and are enjoying a long weekend! Bet these were a huge hit on Thursday. Love the little individual servings but because I could just live on dressing you would have to make one whole muffin pan for me and then one more for everyone else. Enjoy the rest of your weekend Bill! Love the idea of making little individual stuffing servings. And what flavor you’ve stuffed into this recipe! This looks wonderful — thanks. And Happy Thanksgiving! Thanks, John! I hope you have a great Thanksgiving! Loving these mini bread puddings! Definitely going to be making them this upcoming Christmas period – they look SO delicious..